Although Heathrow made a relat­ively late appearance as a hamlet on the edge of Hounslow Heath – its presence was not recorded until 1453 – this area was rich in archae­olo­gical treasures, with evidence of Bronze Age farming and the only Iron Age temple colonnade in England. Aviation began here in 1930 and the government requisi­tioned the site as a bomber airfield shortly before the end of the Second World War. This seems to have been a ploy to sidestep public objec­tions to Heathrow’s intended commercial use when the war was over. Construction of the airport oblit­erated the village of Heathrow and the neigh­bouring hamlet of Perry Oaks, together with the prehis­toric sites. An 18th-century farmhouse called Heathrow Hall was pulled down in 1944. The older and prettier Perry Oaks farmhouse was demol­ished in 1948. The first departure from London Airport (as it was originally known) was a British South American Airways proving flight to Buenos Aires, on 1 January 1946. The airport was fully opened for civil aviation on 31 May 1946. Construction of the terminal buildings at the centre of the airport site began in 1955 and finished in 1968, when a 160-acre (65-hectare) cargo site was added to the south, with a linking tunnel. The cargo area has often been the target of thieves and London’s biggest ever robbery took place here in 1983, when £26 million worth of gold bullion and diamonds were stolen from the Brinks-Mat high security vault. Most of the gold was never recovered. On the airport’s southern perimeter, Terminal 4 was completed in 1986. At the western edge, Terminal 5 was planned from the late 1980s and more than 80,000 artefacts were uncovered during archae­olo­gical excav­a­tions prior to the commencement of construction in 2002. When the terminal opened in March 2008 system faults and problems with ‘staff famil­i­ar­isation’ caused baggage delays, temporary suspen­sions of check-in facil­ities and the cancel­lation of more than 500 flights over a ten-day period. A House of Commons Transport Committee report later called this a ‘national embar­rassment’. For the most part, T5 has since functioned smoothly. Terminal 1 closed in 2015, following the recon­struction and enlargement of Terminal 2. Heathrow airport presently covers 4¾ square miles (12.3 square kilometres). It handles more than 75 million passengers and 1.5 million tonnes of freight every year. Within the airport perimeter 76,500 people are employed and many firms in the surrounding local­ities depend on the airport for their existence. The Piccadilly line was extended to Heathrow in 1977 and there are now separate stations for terminals 2 & 3, 4 and 5. The Heathrow Express and Heathrow Connect links to Paddington opened in 1998 and 2005 respect­ively. The latter will be replaced by the Elizabeth line (Crossrail) whenever it finally opens. Heathrow Airport’s central bus and coach station is the busiest such hub in the UK. Based on Newall Road, in what was the airport’s visitor centre, the Heathrow Academy is a staff recruitment and training facility. Controversial plans to build a third runway and a sixth terminal have been the subject of consultation, resistance and revision for more than a decade. The Labour government originally authorised the runway’s construction in 2009. 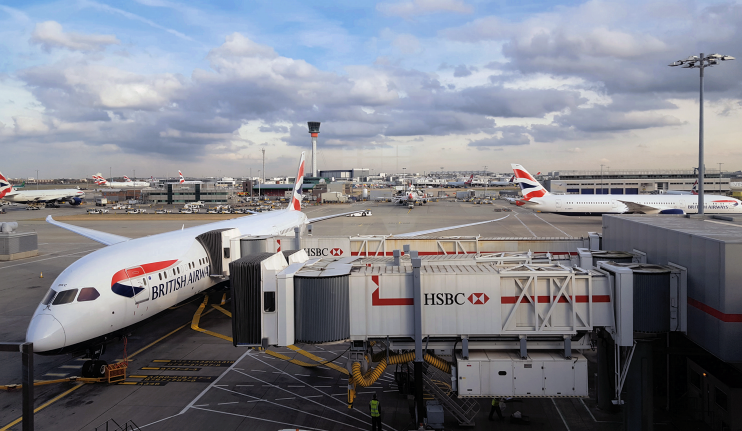 A year later the incoming coalition government cancelled the project and subsequently played for time by setting up the Airports Commission, which was tasked with recom­mending the best way to expand aviation capacity in the UK. In July 2015 the commission unanim­ously concluded that the (revised) proposal for a new north-west runway at Heathrow “presents the strongest case and offers the greatest strategic and economic benefits.” The Conservative government reluct­antly endorsed this recom­mend­ation in October 2016. More stages of consultation are still required – which will doubtless continue to be accom­panied by vigorous oppos­ition, not least because the scheme would eradicate the entire village of Longford, together with half of Harmondsworth and a sliver of Sipson. Terminal 6 is presently proposed for location next door to Terminal 5. Construction work cannot begin until after a devel­opment consent order is granted, which will not be until at least 2021. 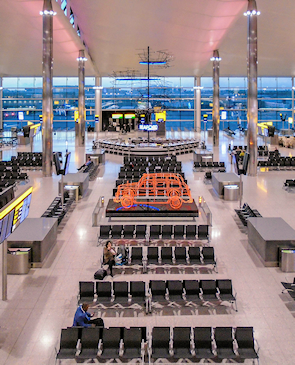 * The view from Terminal 5 at the top of this page is adapted from an original photograph, copyright Christine Matthews, and the picture of the Terminal 2 Departure Lounge is adapted from an original photograph, copyright Peter McDermott, both at Geograph Britain and Ireland, made available under the Attribution-ShareAlike 2.0 Generic Licence. Any subsequent reuse is hereby freely permitted under the terms of that licence.